Below you can find driving directions from Google Maps to help you get from North Bay Village to your nearest Fix Apple Now store, situated in Hallandale. You can either copy the driving instructions below or click here for a larger map and driving directions. 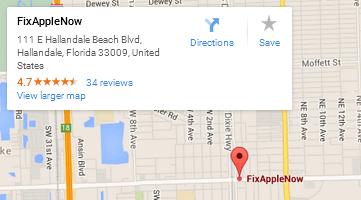 Do you need to repair your Apple device in North Bay Village? Maybe you're stuck with a landscape keyboard, a red screen, an overheating iPhone, “no SIM card” errors or crashing apps? Maybe you're device won't turn on at all? Whatever the case, we can help you if you need a fix for your iPad, iPod, iPhone 4,5 or 6, iMac, MacBook Pro or MacBook Air. Our engineers have years of experience to draw upon and can bring you the excellence you require. We can mend, replace, restore, fix or repair your Apple device for less. What's more is that you can get in touch with us at any time if you have any queries about the services we offer. You can count on us to get your device back to you in full working order within just a few days, so why not contact us today to find out more about getting your Apple device or machine fixed for the right price in North Bay Village?